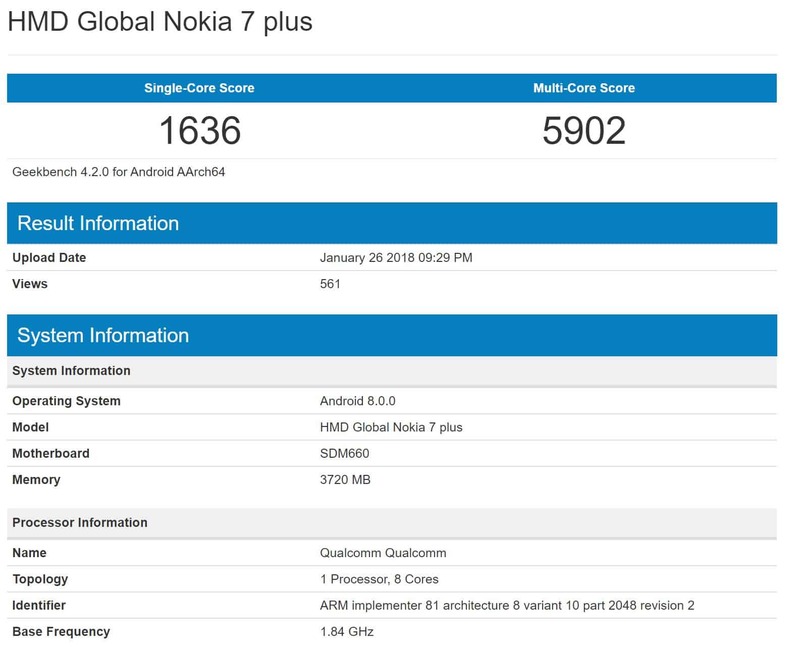 A new device from HMD Global identified as the Nokia 7 Plus appeared in the database of mobile benchmarking tool Geekbench on Friday, having been listed with specs that are relatively similar to those of the regular Nokia 7. The device is powered by the Snapdragon 660, Qualcomm’s most powerful mid-range chip to date that already ended up in a number of commercialized smartphones such as the Xiaomi Mi Note 3, Sharp Aquos S2, OPPO R11, and the ASUS ZenFone 4 (ZE554KL). The original Nokia 7 debuted with the Snapdragon 630, a slightly weaker counterpart to the silicon said to be found inside the Nokia 7 Plus. The newly uncovered listing claims the unannounced device ships with 4GB of RAM, the same amount that’s present in the Nokia 7. However, the handset HMD launched late last year is also available in a more premium variant with 6GB of RAM. It’s presently unclear whether the Noia 7 Plus lineup will also span multiple models or if the benchmarked device will be outright downgraded in this regard. The first Nokia 6 that HMD debuted last year was also available in multiple RAM configurations, with the 4GB variant mostly being sold in developing countries where the competition in the mid-range segment of the market is stronger, whereas the majority of consumers in the West were only able to buy the model with 3GB of RAM. Since the Nokia 7 has yet to become available for purchase outside of China, the Finnish phone company may be preparing a similar product strategy for it. The Nokia 7 Plus was tested while running Android 8.0 Oreo, though the benchmark doesn’t reveal any other details regarding its software. All devices released by HMD in the last 12 months were powered by a relatively vanilla version of Android 7.X Nougat that only shipped with a small number of extra apps and features. The original Nokia 7 debuted with Android 7.1.1 Nougat and has yet to be upgraded to Oreo. The fact that the newly tested handset runs the latest major revision of the mobile operating system out of the box should also guarantee it supports Google’s Project Treble and may theoretically receive software updates in a swifter manner. HMD could announce the device late next month at MWC 2018, with the company already promising it’s preparing something “awesome” for the next iteration of the Barcelona, Spain-based trade show. The post ‘Nokia 7 Plus’ Benchmarked With Android Oreo, Snapdragon 660 appeared first on AndroidHeadlines.com |. You are reading an article on the ‘Nokia 7 Plus’ Benchmarked With Android Oreo, Snapdragon 660. All materials on the site Gadgets F, а также и статья ‘Nokia 7 Plus’ Benchmarked With Android Oreo, Snapdragon 660 - written for the purpose of information enrichment and we are happy if you like our magazine.